The hacktivist group Anonymous “celebrated” the fifth of November (Guy Fawkes Day) through protest marches, defacing websites, and releasing the credit card information of law enforcement officers. The British holiday Guy Fawkes Day was popularized in the 2005 film “V for Vendetta”, where a mask-wearing outcast overthrows a future totalitarian society. The holiday commemorates an actual historical event, where Guy Fawkes attempted to blow up the British House of Lords in 1605. 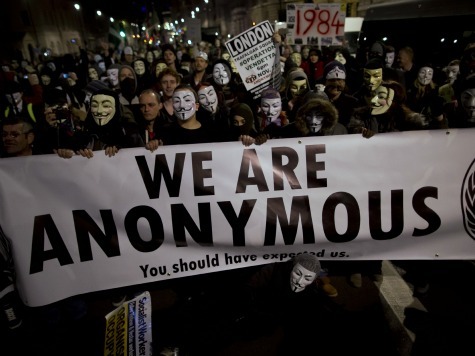 Anonymous used this fifth of November to stage a protest march from London’s Parliament to Trafalgar Square. They also hacked the popular Internet payment site PayPal and computer security company Symantec. Anonymous claims to have released 28,000 PayPal passwords. Other attacks against the websites of NBC and pop singer Lady Gaga were claimed to be the work of Anonymous, but there are conflicting reports as to whether the group was actually involved. Breitbart News contacted people on the list and confirmed that private information about law enforcement officers was leaked, including complete credit card information. One law enforcement officer confirmed that they had already had a number of illegal charges to their credit card this morning. Such releases are popular on Twitter because the popular social networking site allows the easy creation of nearly untraceable, anonymous accounts. It needs to be submitted by the person/persons whose information is being posted. We’d also advise, in a case where someone is linking to credit card information, that those affected cancel or otherwise put a hold on those cards, as even if we withhold a Tweet or Tweets, we don’t have such power over outside content that might exist on the Web. Obviously, even though I had told this employee that credit card information was being broadcast on Twitter by a user with nearly 150,000 followers, the company had no plans to investigate unless someone on the list complained. When I pointed out that the people whose credit card information had been posted would have no way of knowing that it was being broadcast across Twitter, I received no response.